Fatah-Hamas government to be established only with Hamas's 'parliamentary' approval, Haniyeh says. Will the terror group have full control? A 'unity' government between Hamas and Fatah may well be established by the end of May - but only if the Hamas "parliament" approves the move first, Ismail Haniyeh said Wednesday. "Any government that does not obtain the confidence of the parliament will have no constitutional legality, and Fatah and Hamas have agreed on this," Haniyeh said in a speech to lawmakers in Gaza. "The legislative council (parliament) will also monitor the consensus government's work," he said. On Tuesday, senior Fatah official Azzam al-Ahmed announced that he would be visiting Gaza to establish the unity government, which PLO officials estimated will be established by the end of the month. 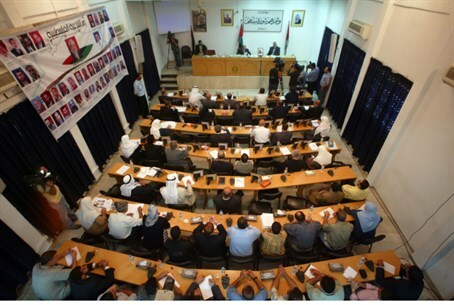 The Palestinian Authority (PA) and Hamas are to form an "independent government" of technocrats according to the deal. However, the chances of true reconciliation between the rival groups remains in doubt. A senior PA official on Sunday said that PA Chairman Mahmoud Abbas told US National Security Adviser Susan Rice last week that Hamas will not be part of the unity government, adding that the terror group "does not need" to recognize Israel or renounce terror. Abbas has stated that the unity government will be under his control. "The EU expects any new government to uphold the principle of non-violence, to remain committed to achieving a two-state solution and to a negotiated peaceful settlement ... including Israel's legitimate right to exist," EU foreign policy chief Catherine Ashton insisted last month. Ashton urged Israel and the PA to resume peace talks despite the pact - based, on Abbas's "reliability" in comparison to Hamas's. "The fact that President Abbas will remain fully in charge of the negotiation process and have a mandate to negotiate in the name of all Palestinians provides further assurance that the peace negotiations can and must proceed," she claimed.